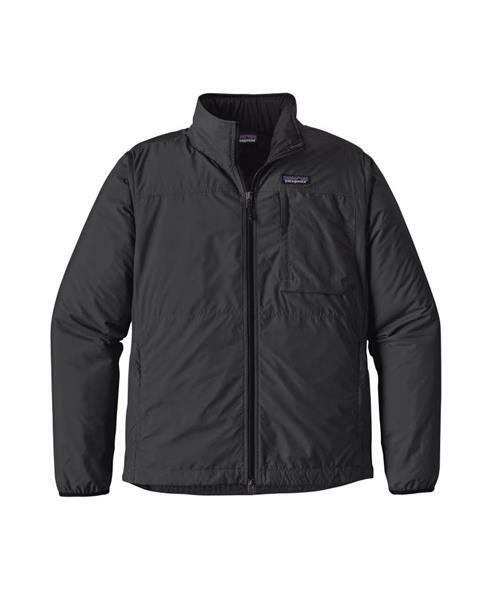 Patagonia made the Lightweight Crankset Jacket to warm up your daily travels, whether far from home or shuttling back and forth to the local coffee shop. Lightweight and insulated, this warm, water-resistant, 100% recycled polyester soft shell stuffs into its own pocket to make a comfy pillow for the ride out of town. Its durable, 50-denier polyester taffeta shell has a DWR (durable water repellent) finish to block moisture and increase abrasion resistance. Inside, a warm, compressible layer of 40-g Thermogreen® polyester insulation (92% recycled) holds in the heat, blocks wind and dries quickly. The stand-up collar protects your neck from wind and cold, seals out drafts and features a stowaway hood. A back vent increases breathability, and reflective detailing on the front zipper and hood provide added visibility for dawn and dusk sojourns. The hem is bound with elastic and adjusts with a drawcord; the cuffs are similarly bound to seal out weather. The Crankset has two side-entry pockets with zipper closures (the right pocket converts into stuff sack) and a left-chest pocket that’s headphone compatible. Hip length. Fabric is certified as bluesign® approved.